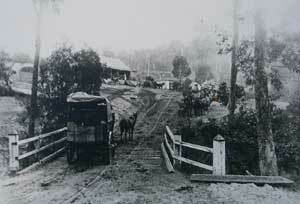 the gold mining, along the edge of the Livingstone Creek. This has resulted in Day Ave, quite rightly and accurately, being described as "as crooked as a dogs hind leg". carrying the title Day Ave while within the town boundary. 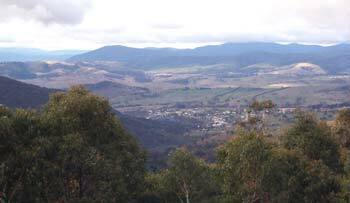 the district began with the Benambra area in 1835 with Livingstone, McFarlane, McAllister and Pendergast but it was the Pendergasts who persisted while the others moved farther south and they are now generally credited with establishing the district. 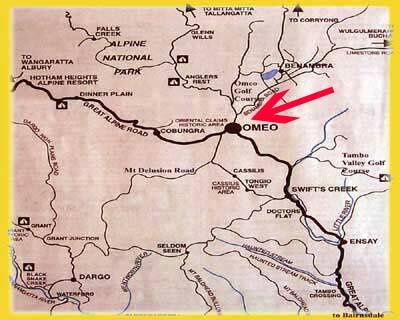 Omeo became the districts main town especially with the creation of the Shire of Omeo in 1872. First glimpse of Omeo on road from Mt Hotham side.